Description: 2nd ANNUAL DRONE VIDEO AWARDS’ TINY WHOOP ANGLE MODE CATEGORY NOMINEES - Tiny Whoop Angle Bowling in Slevania - NOODLEFPV Whooping the Matterhorn - KeleFPV Tiny Whoop - Best of Angle 2018 race course (and bonus) - mrhappefpv Lake Maria - BluJ A Bronx Tail - OracleFPV To vote for your favorite Tiny Whoop Angle Mode video CLICK HERE! Don’t forget to hit “Submit Vote” at the bottom of the page to make sure your vote counts. 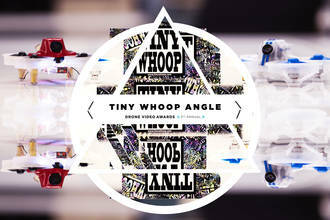 You will have the opportunity to place your votes for the Tiny Whoop Angle Mode category between Monday, February 11th, 2019 and Thursday, February 14th, 2019 (voting closes at 11:59pm CST). The winners of each category of the 2nd Annual AirVūz Drone Video Awards will be announced on AirVūz Live on Facebook on Monday, February 18th, 2019 at facebook.com/airvuz. Click the following link for more information about the contest - www.airvuz.com/2nd-annual-drone-video-awards TO VIEW THE FULL VIDEOS OF ALL OF OUR NOMINEES, CLICK HERE. CONGRATULATIONS TO ALL OF OUR 2ND ANNUAL DRONE VIDEO AWARDS’ NOMINEES!